Powdery Mildew is one of the most widespread and common plant diseases. It effects a wide group of plants, trees and shrubs including apples, beans, wheat, grapes, strawberries and Cannabis to name a few. It’s easily recognizable due to the grayish or white powdery blotches on leaves. Extensive losses in plant growth and crop yield occur annually due to the infestation of Powdery Mildew. Indoor Cannabis growers are especially susceptible to the infection as spores infiltrate the facility and continually infect the Cannabis Buds causing a stunting of growth, distortion of quality, a reduction of terpenes and degraded product that must be discarded. Powdery Mildew is costing the indoor Cannabis growing industry hundreds of thousands of dollars annually in discarded product. Sanuvox has received multiple inquiries from Indoor Cannabis growers concerned with the high magnitude of Powdery Mildew and Botrytis infections. As the regulations clamp down on pesticide use, many growers are looking for a green, non-toxic, non-residue, chemical free solution to treat and prevent Powdery Mildew and Botrytis. The Sanuvox engineering and lab team knew we could assist the indoor Cannabis Grower with our 21 year history of UVC airborne spores and contaminated surface disinfection experience. UVC or Ultraviolet C Germicidal wavelength is lethal to all micro-organisms including Powdery Mildew and Botrytis. This technology has been used for over 100 years in the water treatment industry and over 40 years in the air treatment industry as a leading method of micro-organism contaminant disinfection. During our research and trials, we’ve seen germicidal UVC utilized in many different methods to combat Powdery Mildew. Early on, Sanuvox tested the method of irradiating the Cannabis leaf surface to kill the visible powdery mildew spores with limited success. Not only was this method extremely time consuming for the grower, but the powdery mildew would re-emerge 12 hours later. This is because the visible Powdery Mildew molds were already rooted deep within the bud and regrowth happens very rapidly. The next method Sanuvox tested was to utilize small portable air treatment units that had low CFM (cubic feet per minute airflow) and only processed the air once every 2 days. This was found to be ineffective as well as the level of spores within the facility quickly outpaced the level of disinfection removal. Our engineering team achieved a breakthrough and discovered that the best method to defeat Powdery Mildew was one of prevention. It was best to not wait until the Powdery Mildew infection showed up visually before applying a treatment method. The best method of prevention is to continuously kill the spores through high dosages of germicidal UVC Air Disinfection and at a very high frequency each hour. This approach continuously keeps the Powdery Mildew spore levels low enough for the plant to defend itself naturally. Sanuvox has developed and patented a germicidal UVC Air Disinfection sizing system to determine the precise UVC dosage, performance, and product size based on an individual grower’s facility specifications. We do not believe in any magic rule of thumbs for the prevention of Powdery Mildew. The optimum installation point of the UVC BiowallTM system is the return or supply duct of the HVAC system. 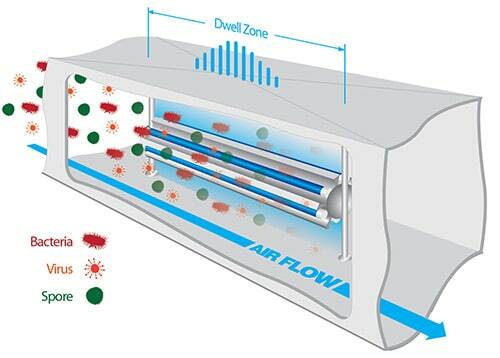 Similar to a firewall, Sanuvox disinfects the air within the ductwork with its patented BiowallTM units. 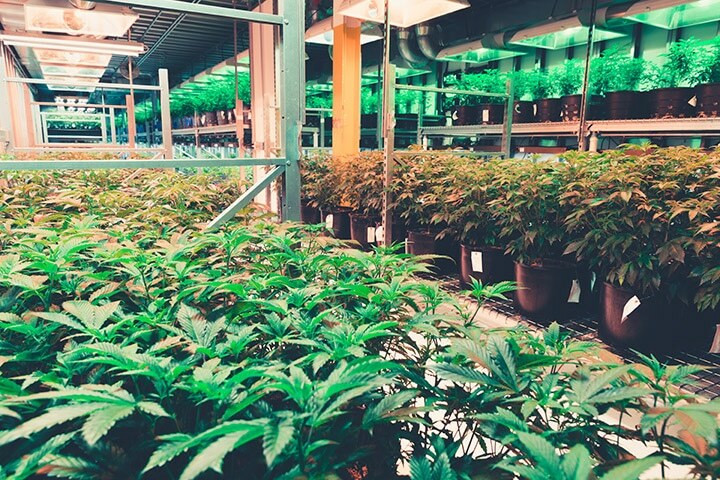 By delivering very high dosages of germicidal UVC as well as achieving 8-12 air changes per hour, our system continuously achieves over a 96% disinfection rate of Powdery Mildew within the grow space every hour. Applying this technology resulted in a success story in Colorado with Organic Alternatives. Their facility is 6,000 sq. feet with 4 Flower Rooms that have been burdened intermittently with Powdery Mildew. Sanuvox began installation with Flower Room B as it was their most problematic room for Powdery Mildew and Botrytis outbreaks. Flower Room B is approximately 1,200 sq. feet with 14 foot ceilings. Three 5 ton units operate in this room equating to an estimated 6,000 cfm and an air change every 2.8 minutes. 21.4 air changes per hour can be achieved in Flower Room B. Temperature of 75 degree F and Humidity of 30% are maintained in Flower Room B. There are 44 Gavita lamps of 1kW each operating in Flower Room B. The three 5 Ton HVAC systems within Flower Room B are each 2,000 cfm with return duct dimensions of 32”x14”, operating with 1” MERV 8 filtration changed monthly. Based on above parameters and a return duct installation point, Sanuvox recommended a 24” BiowallTM UVC Air Disinfection system be installed in each 5 ton HVAC system within Flower Room B. Sanuvox’s proprietary UVC performance and sizing software estimated this grower would achieve a 99.8% average disinfection of Powdery Mildew after only 8 air changes. With three 5 ton HVAC systems and 16,800 cubic volume of air in Flower Room B, 8 air changes were achieved every 22.4 minutes. Every hour the BiowallTM system was operating, Flower Room B achieved 21.4 air changes corresponding to an estimated 99.9% disinfection of Powdery Mildew per hour in Flower Room B. Due to space constraints the BiowallTM system was installed in the return duct and was turned off during the dark growing cycle, maintaining a runtime of only 12 hours a day. With only 12 hours of runtime, the following results were achieved below during the first Post UV harvest. lbs. of infected product discarded 6 lbs. 1.5 lbs. 90% reduction in utilizing organic fungicides in Flower Room B (before BiowallTM UVC, this was the primary method of controlling Powdery Mildew and Botrytis). Powdery Mildew can be a tough and constant battle for indoor cannabis growers. 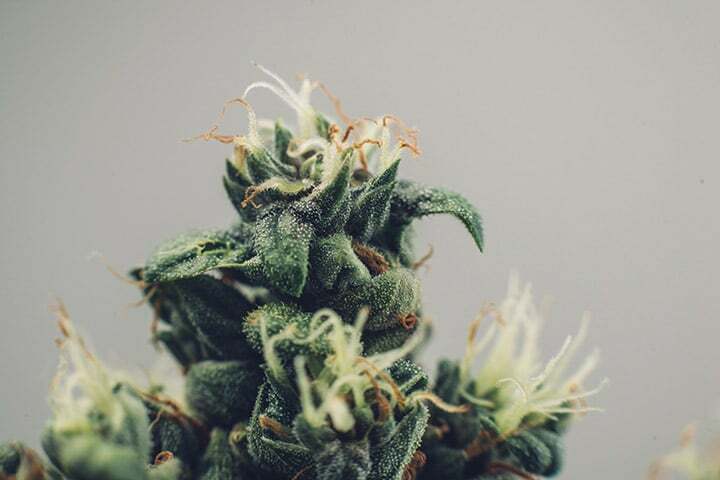 Sanuvox believes we have pioneered a reliable, green, non-toxic, chemical free, non-residue and preventative approach to battling the common Powdery Mildew and Botrytis spores that can damage the quality and quantity of your Cannabis harvest. © 2019 GrowSaver by Sanuvox. Web Marketing Agency in Montreal - My Little Big Web .